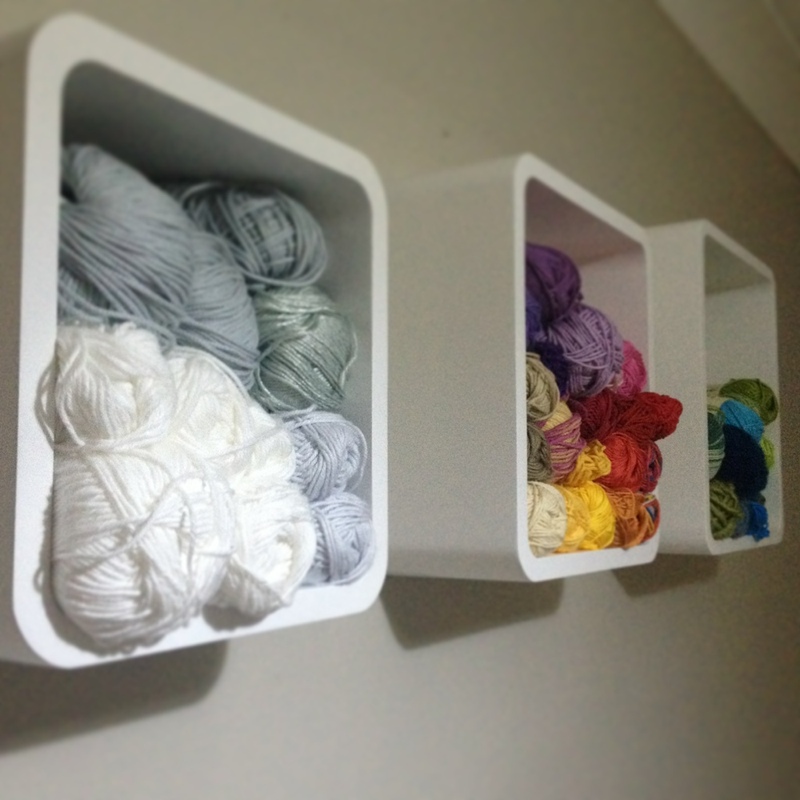 Yarn storage. 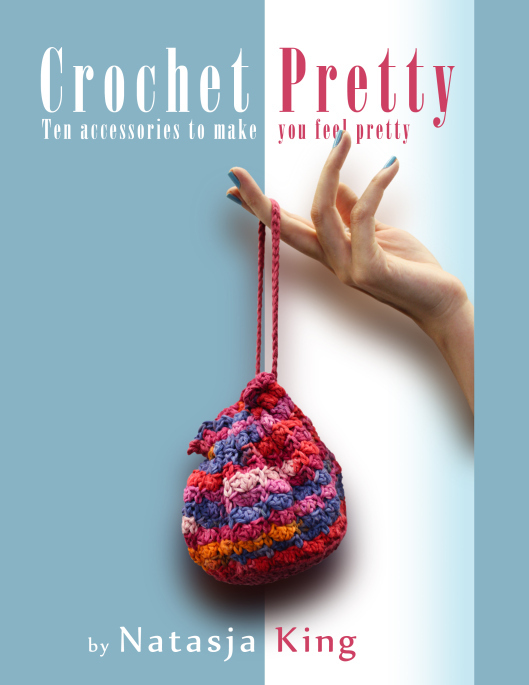 The age-old question for any crocheter or knitter. 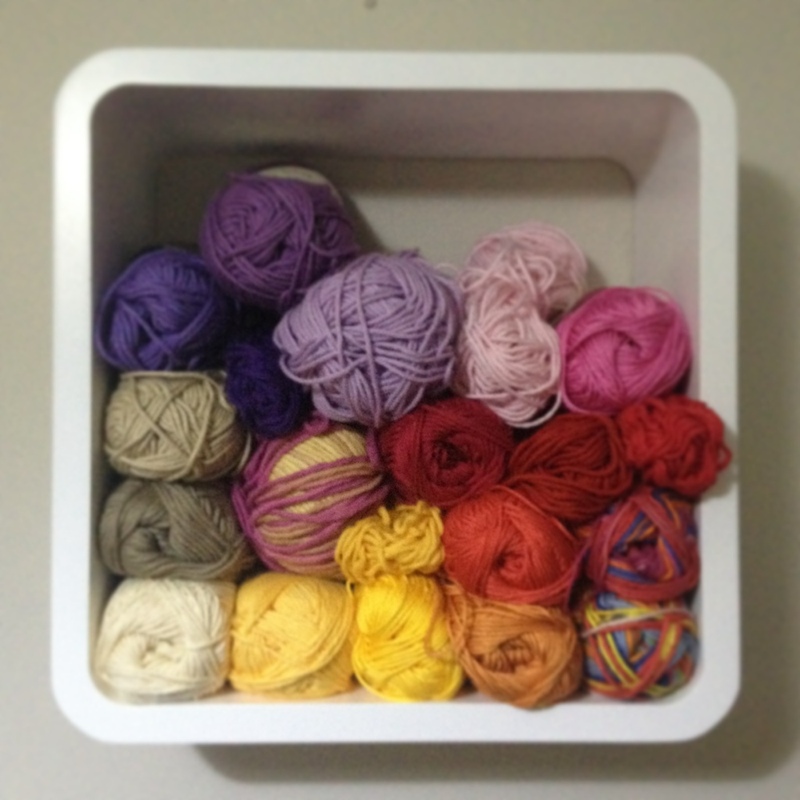 Do you display your yarn or hide it? Do you arrange it according to colour, weight or fibre? So many choices! A lot depends on the space available. In my case, I have a cupboard in the spare room with a canvas shoe organiser like this one, a couple of tote bags hanging from hangers in the same cupboard and the cardboard box that my Anchor crochet thread winnings arrived in. I thought I had a good enough system as everything is hidden away yet easily accessible. 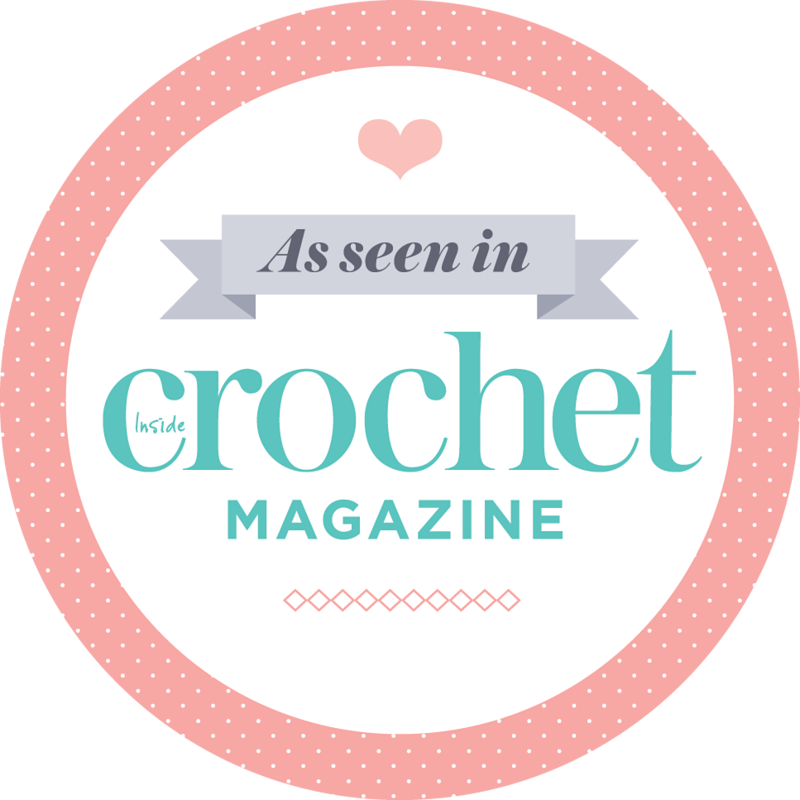 John saw my Yarn Pinterest board with beautiful yarn storage ideas. 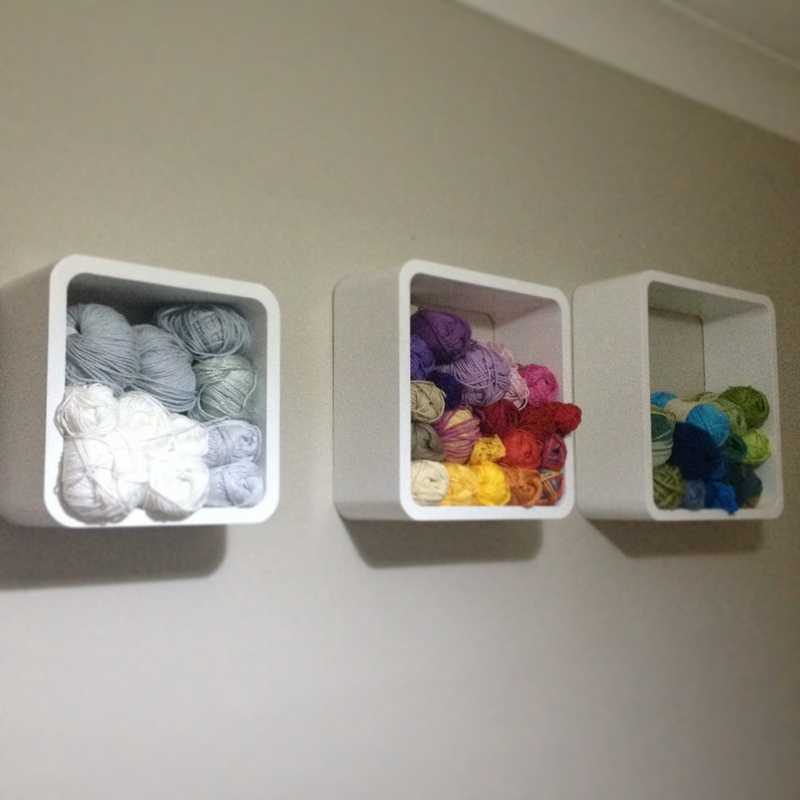 Not only that, he was the one who found the perfect yarn storage solution: three wooden wall cubes at a discounted price with Wowcher. Like the man says: that’s how he rolls. We both love this Wall Of Yarn Art – it changes all the time as I use yarn and buy more. Never a dull moment. Literally. Of course I still have the shoe organiser and tote bags, but they now only hold acrylics and other odds and ends. I’ve reserved my wall cubes for cotton only. Most of my cotton yarn is Rowan Handknit which comes in 50g balls and fit perfectly into the cubes. I just love the huge spectrum of colours. It truely is inspirational to see such a colourful selection right there on the wall. My creative juices flow as soon as I walk into the spare room. Did you notice the empty space in the biggest cube? The one with the blues and greens? I certainly noticed and aim to rectify this soon. All in the name of art yarn. AWESOME!! and what a great hubby you have….does he have a brother? i hide all myy yarns… but then again i tell a few as well…. Fabric would look great in the cubes! I love the very modern white on (is it) white (?) of the cubes and wall, tempered by the splashes of color, the softness of the yarn. Gorgeous!!! And yes…you need more blues and greens. All for art…yarn. What a sweet husband you have! I have too much yarn – most of which is crammed into a dresser that now barely closes. I’ve been yarn dieting since Jan.1. Once that settles or me, it will be more creative displays like this.